Here's another craft book if you're looking for a new hobby. A little more difficult in my opinion, but nevertheless tempting, and, there's a mosaic section too. It's mostly twisted, coiled, spiralled, or bent wire, cleverly positioned around glass objects. The use of pretty beads is most attractive and an excellent way of transforming a dull old vase into something new and personal. I've heard it said that once you get twisting and manipulating the wire, the more you want to do it. You can even make new Christmas decorations for your tree, or new candleholders for example. This is a comprehensive introduction and also includes what equipment you'll need, which materials, as well as basic techniques. Beautifully illustrated. 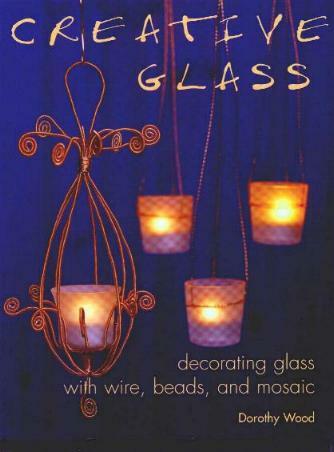 CREATIVE GLASS may be purchased and/or ordered through your local bookstore. Conclusion - Would make a great gift for anyone, especially those needing ideas for craft markets.